Being wild at heart doesn’t mean you need to look like a beast. Whether you’re a bearded man or prefer the clean-shaven look, a little basic maintenance is all you need to look and feel like the hunk you really are. The Man Grooming Kit range is all about grooming made simple. From the rugged mountain traveller, to the beach bum, rev-head, or sleek CEO, the Kit provides you with all the essential tools to make your life a whole lot more man-agable, letting you focus on all the awesome adventures that life brings your way. We’re all about grooming made simple. 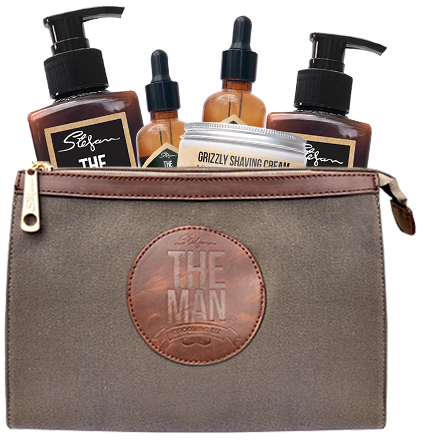 The Man’s complete grooming kit contains all the essential tools to make your life a whole lot more man-ageable. Everything you need to tame the beast! The essential all in one shaving & after care kit every man needs. Get your man grooming kit today!